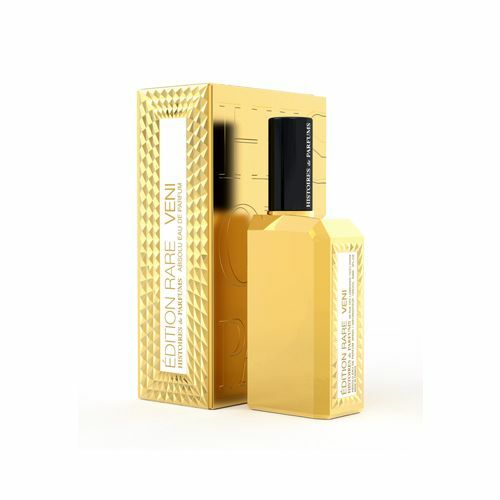 Histoires de Parfums Édition Rare Vici Eau de Parfum is the third fragrance in the Edition Rare golden trio. Vici, latin for 'I conquered', forms part of the famous quote 'Veni, Vedi, Veci' which means 'I came, I saw, I conquered'. Vici battles the senses with Cardamon, Pink Peppercorns, Basil and Aldehyde as its prominent top notes. The scent quickly settles into a heart of Rustic Lavender, Iris, Osmanthus Absolu and Essence of Incense making it wonderfully fresh yet deeply desirable. The base is formed of Patchouli, Musk, Cedar and Raspberry which make for a perfectly balanced unsiex scent. Spray Histoires de Parfums Édition Rare Vici Eau de Parfum (60ml) onto the pulse points and wear with confidence. Use sparingly. Histoires de Parfums Édition Rare Vici Eau de Parfum is highly concentrated.